This binder is an elegant choice for presentation and storage. It is bound in durable bookbinder's cloth and features steel hardware. The Black binders feature a Gray interior. A cardholder on the spine identifies the contents within. 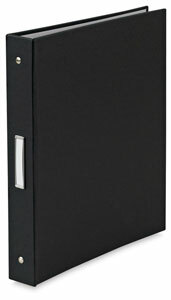 The ½" binders hold up to 90 sheets, and the 1" thick binders have a capacity of up to 175 sheets.